Neil Mackay, blacksmith of Forse, died 23rd August 1876 aged 78. 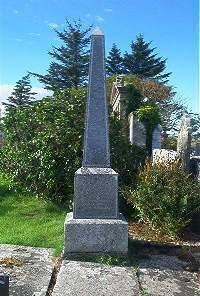 Wife Mary Waters died at Wick 26th May 1881 aged 82. James Waters Mackay, blacksmith, died at Springvale Waihola New Zealand 28th September 1870 aged 31. Donald Mackay, blacksmith of Forse, died 20th March 1880 aged 51. John Waters Mackay, bank agent and town clerk at Wick, died 22nd January 1882 aged 50. Jessie Mackay died 4th December 1896 aged 69.